Re Room Escape-Ladies Gym info about the game-Games2Rule. 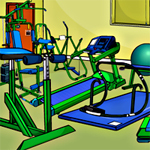 Room Escape-Ladies Gym is another new point and click room escape game from games2rule.com. You�re trapped in the Ladies Gym. The clue to open the park is somewhere inside. No one is there in the surrounding to ask for help. Is that easy for you to escape from the Ladies Gym with your mind-stuffs alone? If it is so, just escape. Good Luck and Have Fun!